Please fill in the form below for your produce order. 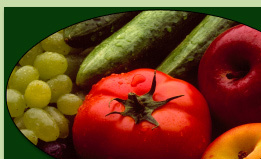 Your produce will be delivered Monday PM to the nTelos building in downtown Waynesboro. If an item is temporarily out of stock, you will not be charged for that item. Any price changes will be made prior to the following weeks orders. To see a complete listing, click here. Select: 0 pounds1 pound2 pounds3 pounds4 pounds5 pounds ½ Peck (6 pounds) Golden Delicious Apples-$0.99 per lb. Select: 0 pounds1 pound2 pounds3 pounds4 pounds5 pounds Granny Smith Apples - $0.99 per lb. Select: 0 pounds Hydroponic Tomatoes - $2.79 per lb.